For many, Mother’s Day is a day that is dreaded and some wish to avoid altogether. If you have walked through infertility, early pregnancy loss, or a loss later in pregnancy/after birth, you understand the feelings this holiday can bring. With it can come confusion, doubt, anger, and loneliness. I remember my first Mother’s Day after our first miscarriage. I remember making sure my husband knew I wanted to be acknowledged that day because I knew that feelings of anger might arise if I was forgotten or not seen as a mother. Though it has been a few years since that first holiday, I can still remember how empty it felt. How empty and broken I felt. I felt confused on whether I was even a mother. Loneliness crept in. I didn’t know anyone else journeying on this unwanted road. I didn’t want to be here. I was angry. However, it was not because those around me didn’t try to love me well. My husband brought home flowers, dear friends messaged me that they were thinking of me, another friend sent me a beautiful necklace with two hearts and a February birthstone since that was the month we lost our little ones. I received cards in the mail from loved ones letting me know I wasn’t alone. In all of these ways, they all fell short because my heart was empty. I was broken and wasn’t ready to accept the love from all those who cared for me. 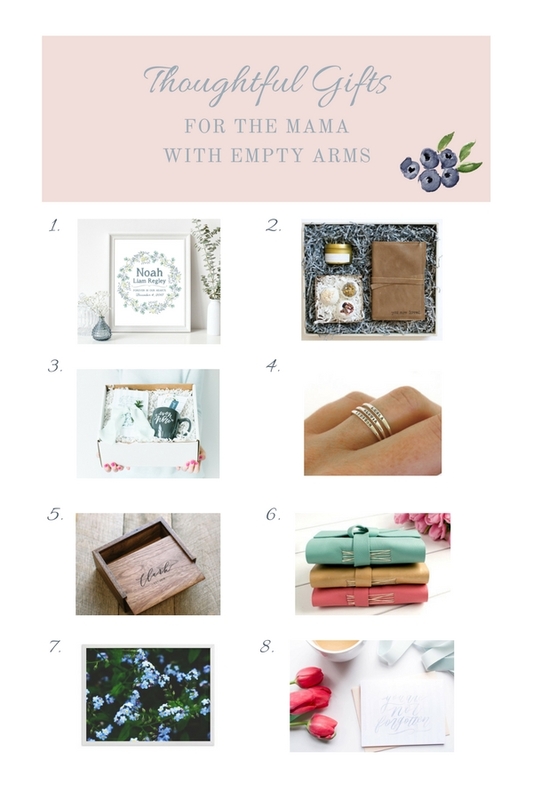 With Mother’s Day just around the corner, I wanted to take some time and put together a meaningful gift guide for those of you who may want to love on that friend in your life but just aren’t sure what to give. I know there are times when, no matter how thoughtful a gift is on your end, you feel like it comes up short and does not meet the specific needs to comfort your loved one. I want to encourage you that your gestures mean something. They mean that you see her. You are acknowledging and remembering her baby and her role as a mom. Or perhaps you are someone who is walking through a season of loss, and you have been looking for a way to acknowledge and remember your little one. This guide is for you as well. I hope these gift ideas can be a starting point for you to think through what you would like as a way to memorialize and remember you sweet little baby. A Beautiful Remembrance- This beautiful shop offers personal prints for families who have lost little ones. Both in pregnancy loss and afterward. LaurelBox- offers specially curated gift boxes for women walking through grief. The one pictured above is specially curated for the mama who has miscarried and/or is walking through infertility. Lilia Grace offers beautiful and meaningful products, all of which would make a thoughtful gift for someone walking through pregnancy loss. Personalized Jewelry. The picture above is a cute little Etsy shop that designs personalized rings. However, you could look also consider a bracelet and/or a necklace with an initial, birth date, birthstone, or a symbol that would be especially meaningful to the mama. Dear Mushka offers affordable, beautiful pieces that are all designed around specific scripture. A Keepsake Box- For many early pregnancy losses, there isn’t even an ultrasound picture. This little keepsake box or something similar could be so meaningful to keep what little objects she does have. Such as her first pregnancy photo, pregnancy test, an object of where she was when found out she was expecting, etc. A Journal would also make a beautiful and thoughtful gift. This offers her a safe place to process and cry out to the Lord in her distress. It is a beautiful way to acknowledge and remember how the Lord is working. A photo and/or a piece of art- This Forget-Me-Nots photo would be something beautiful to display in their home as a memorial. A dear friend of mine has a picture of pink flowers that she took after her losses still displayed in their home even though it has been several years. Something like this could be so personal and meaningful. A meaningful sympathy card- This is new to the Lilia Grace shop! 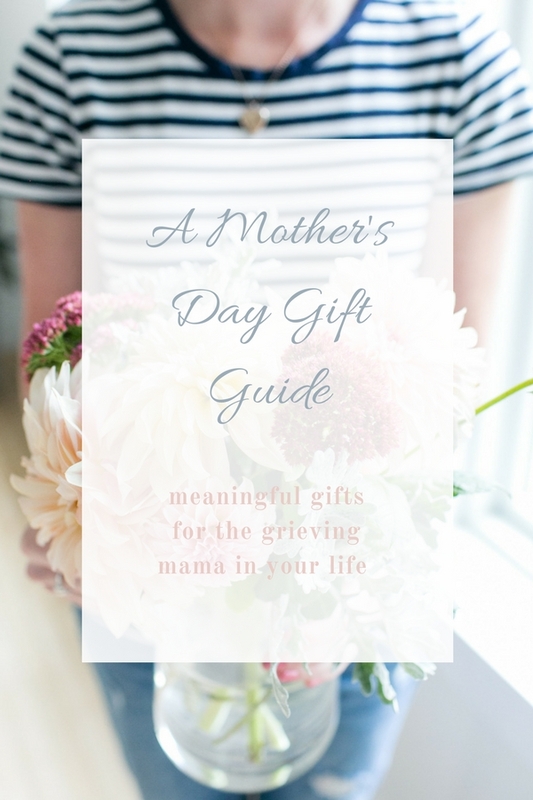 A special Mother’s Day card specifically designed with grieving mamas in mind. There are SOOO many ideas, these are just some that I was able to put together. Remember, the important piece in all this is that your loved one would feel remembered and loved. Mother’s Day is one of the most difficult holidays to walk through, so something small, beautiful, and meaningful could mean the world to her. I would love to hear, have you received gifts during your loss that meant something really special? Or do you have any other gift ideas? I would love to hear about them below!